The Avi Choice Awards are open for voting – and you can vote for us! In fact, you can vote for us … and many, many of the people we have featured in Prim Perfect magazine, or on Designing Worlds or Happy Hunting. In short – the Avi Choice Awards represent a fantastic array of Second Life talent – and all nominated by the people behind avatars out there on the grid. We’re in Entertainment – and you’ll see that Prim Perfect is nominated in the Best Magazine category, while Designing Worlds and Happy Hunting both feature in best TV show. And if you are regularly readers (or viewers) you will doubtless recognise many of the names of nominees too! 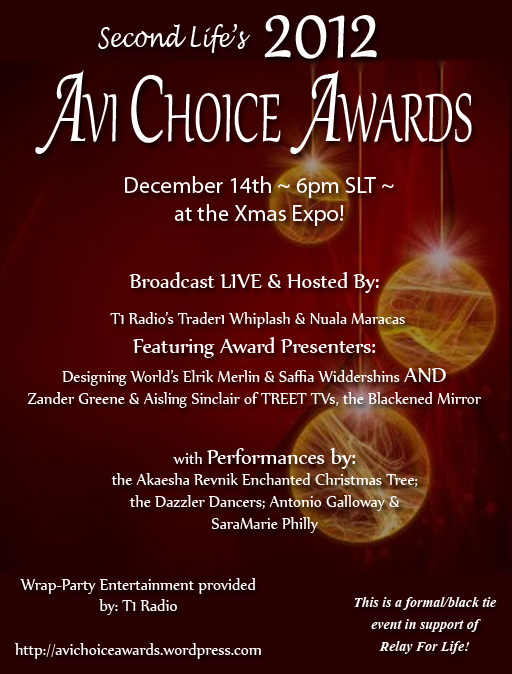 The whole process culminates in an amazing awards presentation on December 14th from 6pm SLT onwards, a highlight of the Second Life Christmas Expo. Elrik and Saffia (hosts of Designing Worlds) presented part of the programme of awards in 2011, and we are hugely honoured to have been asked to do this again – and this year, we’ll be joined by Aisling Sinclair and Zander Greene, stars of The Blackened Mirror. Zander, of course, is the holder of the individual Spirit of Relay Award for Relay for Life of Second Life 2012 – and the funds raised by the Expo will go to support Relay for Life of Second Life 2013. Next Post: Celebrate the Blackened Mirror with a party, a new fun noir game and a new radio episode!